“Look at that ant,” she said. It’s not an ant, though. Ants have six legs, not eight. And ants sure don’t have those iridescent chelicerae in front. Or the row of eyes right above the chelicerae. It’s a jumping spider, apparently Myrmarachne formicaria. Look how the spider even holds its palps under the chelicerae to help with the disguise. This is one of four males found overwintering in an old toy bulldozer left in the woods of upstate New York. We brought the toy inside and a day or so later noticed these. Once they had warmed up, they were quite active and readily accepted small flies. 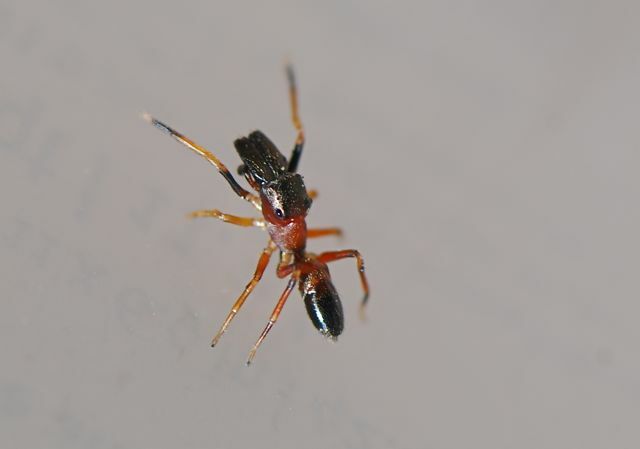 Myrmarachne formicaria is a ant-mimic jumping spider that was first found in the United States (in Ohio) in 2001. Obviously its range is spreading. Have you ever been fooled momentarily by a spider that was an ant mimic? Have you ever seen one of these? Richard A. Bradley, Bruce Cutler, Maggie Hodge. 2006. 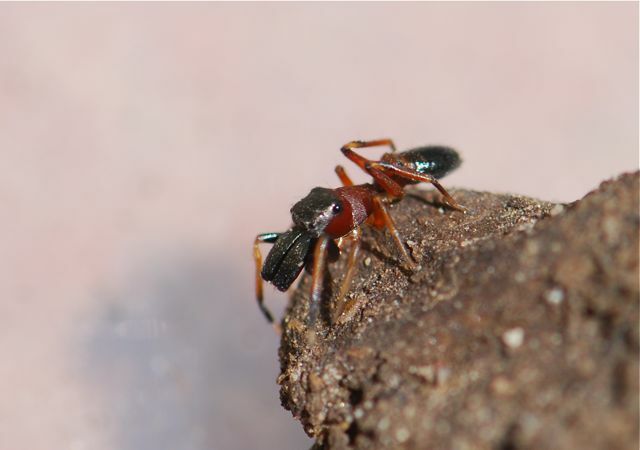 The first records of Myrmarachne formicaria (Aranae, Salticidae) in the Americas. Journal of Arachnology. 34(2):483-484. I have these in our house this summer. We live about an hour outside Toronto Ontario. These spiders seem to be active right now. About a week ago I found a bunch of these in our driveway almost like an ant colony and since then have seen a few in the house. Now that I’ve established they are spiders not ants, I’m kind of freaked out! Why would there be so many together like that? It is a bit early, but these spiders apparently overwinter together in groups. They may be looking for places to shelter. We’ve got plenty at our house in Ohio. I thought they were ants on my living room walls until I saw one making web to travel down frim my basement ceiling. Does anyone know whatvtheor nests look like? We have seen quite a few at our house. They come in the very late summer and early fall, especially now the heat spell is over. It’s kind of creepy that what you think is an ant suddenly drops by a web. We live in the out skirts of Youngstown Ohio, closer to Kent. It’s a wooded area we are slowly reclaiming to farm. These little guys keep coming in the house. My boyfriend said he has seen them since he moved here 6 Years ago and their frequency of visiting the house is growing. I live in Buffalo NY. This is the first year I have seen these here. They are inside and outside. We have been seeing these this past week in Genesee County, NY. I thought the first one was an ant until I picked it up and found it hanging by a silk thread. Pretty neat. Given the number of comments I’ve been getting they seem to be pretty active this year. First year ever seeing these spiders in Ontario, NY. The past ten or so years there has been an increase in very large wolf spiders in the area. Early fall they start showing themselves in large numbers around perimeter of house. Halloween guests I suppose, lol. I like the Halloween guest suggestion. I just found one of these making a web in my house in cuyahoga falls, ohio. It looks so much like an ant but creepier. I don’t like thinking that they can jump. They don’t jump all that far. Another sighting near Buffalo, NY. Shooed it from the ceiling- down it came by web. Seemed like it had a pretty hard exoskeleton though. I’ve wondered what these are…We live in Warren, Ohio. I first seen one about 3 years ago and thought it was some kind of ant as well. I decided to look it up when my sister-in-law, who lives two streets over, asked me if I’ve ever seen one. She just apparently noticed them in her house this summer. Colin, It does seem to be the radius. Good observation. Buffalo here and I just moved here from the South two years ago. I have never before seen a spider like this, but have now seen quite a few. Usually they are just outside the door, but I found one on the carpet this morning. I took a picture and saw the 8 legs. They look aggressive and that is the only thing that bothers me about them. I had to look this up, I’m in southern Ontario. Unfortunately I killed it assuming it was another ant (we’ve been having an ant problem). I’m rather fond of jumping spiders so I was disappointed to see that it was a spider after all. I wonder what benefit is there for it to look like an ant? Just found one in my home in Putnam County, downstate NY. Interesting little thing. Found one in the kitchen today. Welland, Ontario, Canada. Never seen or heard of them. @Christina there are one or two types of mimicry at work here, from what I’ve been reading. The first (and probably most likely) is Batesian mimicry, where they try to look like an ant. Many predators (birds, etc) find spiders to be a great snack… ants, not so much (they emit foul-tasting chemicals and can be aggressive). 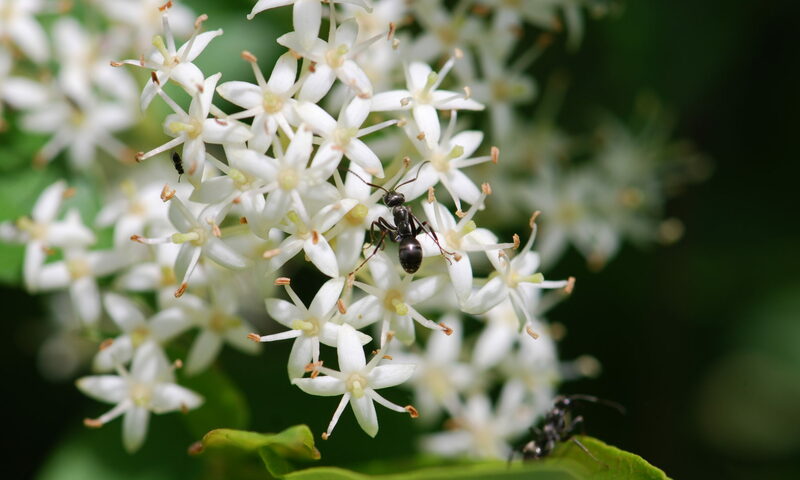 By making themselves look like ants, these spiders are less likely to be preyed upon by the usual suspects who mistake them for ants and avoid what they believe to be a bad lunch choice. 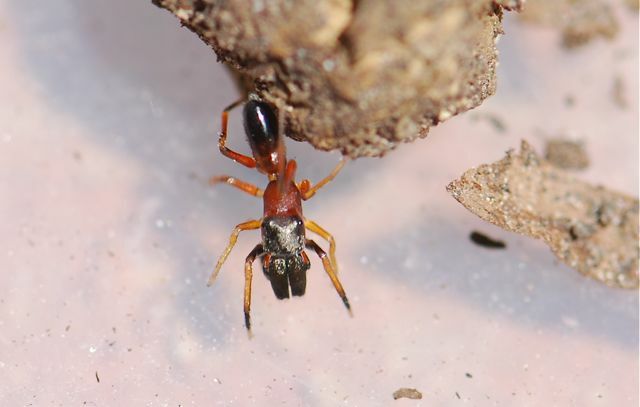 The second type I might suspect would be aggressive mimicry, where they try to look/act enough like an ant to fool ants into allowing them close enough to attack and eat the ant. As far as I’m aware though, aggressive ant-mimic spiders tend to not be as visually similar as actual ants, since ants have poor vision. These spiders are nothing to worry about. 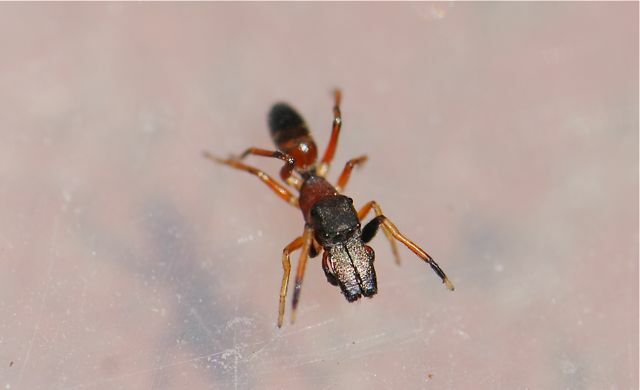 Hi… I Love this Ant Mimic Spider! Will usually have little tiny annoying ants in the summer… well, about three years ago we got those bigger ants like, soldier ants or carpenter ants, and then…shortly after I noticed those ants, Along Comes This little spider that I thought was an ant…and he’s holding his little front legs…mimicking antenna..so, I looked it up. and Along Came those ant mimicry spiders and the Ants disappeared! They are here in Killeen, TX. They seem to see very well. Erik, You are our first report from Texas. I found one of these in my house in Dallas, TX! I thought it was an ant but when I attempted to throw away the envelope he was on he strung himself to the floor with his web. Wow. Any way it could have been transported from areas further east? Today was the first time I’ve ever seen one of these spiders. I thought it was an ant and realized quickly that it is a spider. I tried to take a couple pictures of it but the little bugger wouldn’t sit still long enough to snap a shot. It scared the crap out of me as I was attempting to get that picture and it jumped out at me and was hanging off the table. I live in Central Pennsylvania. Just found one in my house in upstate New York! Neat! Does anyone know if they bite or sting? Jumping spiders like this one are capable of biting if they are captured or pinned down (in defense). However, they are small and their venom isn’t poisonous to humans. This post was made 7 years ago, but we’re starting to see a bunch of these spiders around our home in Vaughan (north of Toronto, ON). Seems like a pending infestation. How do we stop them?! I have been finding these spider in our house in Markham, Ontario, Canada. I have never seen these insects before as a child or now as an adult. Now I’m finding them in our house and crawling outside the house. Not sure how they’re getting inside. Each day I kill at least 5 or more and they seem to be increasing. They’re nasty and creepy and I want them gone! I welcome suggestions. At this point they seem to be pretty widespread. What generally happens with newly introduced species is that they spread around, and then slowly predators and parasites begin to eat them until they are not as noticeable any more. Nature is cool that way.